Quinoa is a native food plant of high nutritional value, grown in the Andean region and used as food by the Incas and previous cultures. Quinoa provides a nutritional, economical, easy-to-prepare and flavourful food source which is particularly useful for those with a gluten intolerance as it is a gluten free seed. It is a well digested source of quality protein which has a good balance of amino acids. It is exceptionally high in lysine, an amino acid which is not overly abundant in the vegetable kingdom. It is also a good complement for legumes, which are often low in methionine and cysteine. 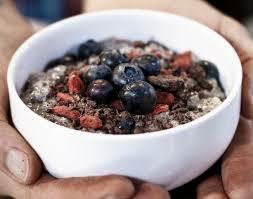 Quinoa also has a relatively high quantity of vitamins and minerals. It contains more calcium, magnesium, and zinc than common cereals, and also has a particularly high iron content. 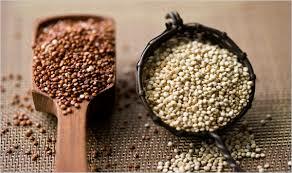 Quinoa seeds are also a good source of Vitamin C, Vitamin E, B-vitamins (B1, B2, folic acid), potassium, and copper. Quinoa seeds also contain some good quality vegetable oil (unsaturated fats) and are high in fibre. Place the quinoa and stewed apple in a wide saucepan and add 1 cup of rice milk. Bring to a boil over high heat. Reduce heat to low and cover pan. Cook for 5 minutes, stirring occasionally until quinoa becomes hot. Add cinnamon and berries, followed by cinnamon (as desired), shredded coconut, LSA and hemp powder (optional), The more milk added more runnier the porridge will be!